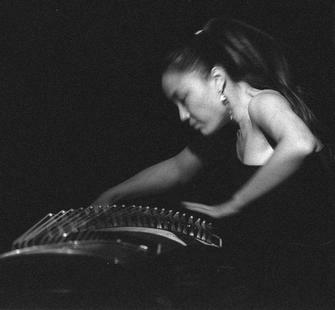 Born and raised in Beijing, Wu Fei is a composer, vocalist and guzheng (Chinese zither) performer. She spent her formative years at the China Conservatory of Music before coming to the United States in 2000. She holds an MA in Composition from Mills College and is a grant recipient of "Meet the Composer." While at Mills, she began to diversify her sound and experiment widely, working with musicians like John Zorn, Fred Frith, Carla Kilhstedt, Pauline Oliveros, Kazue Sawai and Cecil Taylor. Wu has composed for choir, string quartet, chamber ensemble, Balinese gamelan, orchestra, film, and modern dance. Her commissions include a composition for Percussions Claviers de Lyon that premiered in the Forbidden City Concert Hall in Beijing. Wu has performed in cities around the world, including Beijing, Shanghai, Berlin, Dublin, Johannesburg, Milano, New York, Oslo, Rome, Rotterdam, and San Francisco Bay Area, plus more. Her debut album, A Distant Youth (2007, Forrest Hill), features both Frith and violinist Carla Kihlstedt. In fall 2008, her second album Yuan was released on Tzadik Records. In 2009, after performing in music festivals in Norway, Netherlands, and Belgium, Wu presented a duo concert with experimental jazz legend Evan Parker at The Stone in New York City. Later in that year, a DVD entitled "Shan Qi" was released (Ozella Music), filmed in the Italian Alps and highlighting the young artist and several outstanding European musicians, including Guo Yue, Giovanni Amighetti, Guido Ponzini, and Helge A. Norbakken.In 2010, Wu spent most of her time in China learning traditional Chinese folk operas and collaborating with musicians in Beijing. She also started another cross-culture collaboration with American banjo player/singer-song writer Abigail Washburn composing and performing innovative music that draws on both Chinese and American musical traditions.